Frequently sporting a $2 billion plus market capitalization, Acadia Pharmaceuticals brings to mind the work of Belgian surrealist Rene Magritte. His 1929 painting “The Treachery of Images” depicts a pipe with the inscription “This is not a pipe,” suggesting that an image and its meaning don’t necessarily correspond with each other. 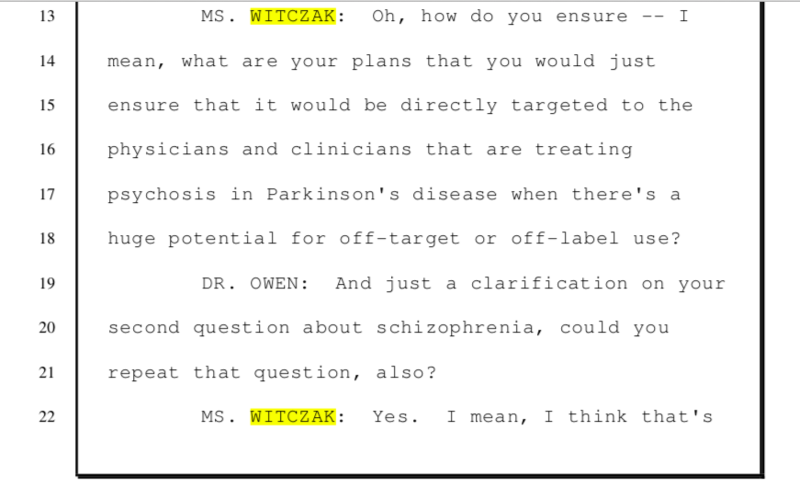 This is troubling since evidence is mounting that something is horribly wrong with Acadia’s sole drug, Nuplazid, an antipsychotic for Parkinson’s disease patients who experience episodic hallucinations and delusions. These are symptoms of a condition called Parkinson’s disease psychosis. In April CNN uncovered a dramatic increase in the number of reports involving Nuplazid filed with the Food and Drug Administration’s adverse events reporting system. As noted in CNN’s reporting, an adverse event report does not mean that a drug is the cause of harm, but the document is used to help track possible issues. In the wake of CNN’s story, FDA Commissioner Scott Gottlieb took the unusual step of telling lawmakers he would order his colleagues to “take another look” at the drug. 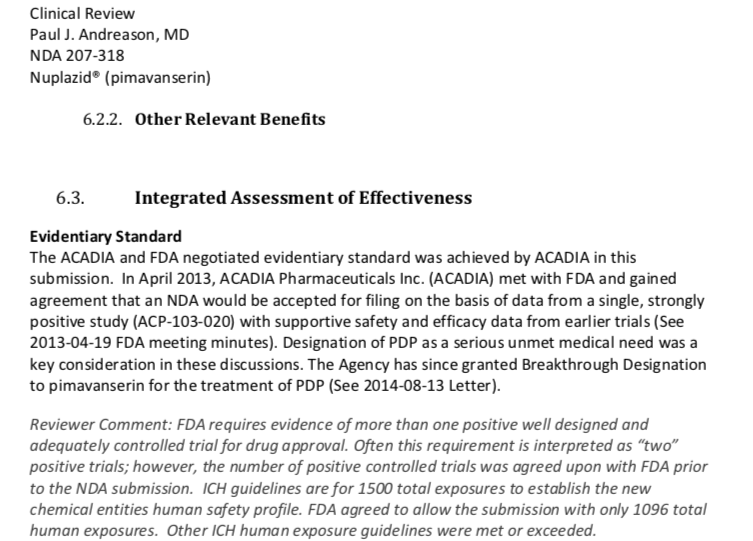 In reply to a question about Gottlieb’s statement, Acadia sent the Southern Investigative Reporting Foundation a six-page press release from April 27 that asserted the FDA had not determined the drug posed a new risk and that doctors could continue to prescribe it. Acadia has accomplished its growth in ways that have attracted intense regulatory scrutiny for other drug companies. The questionable practices include dispensing wads of cash to doctors to incentivize prescription writing and downplaying mounting reports of patient deaths. Central to Acadia’s marketing is promotion of the faulty illusion that Nuplazid received FDA approval like any other drug — after successfully passing a series of clinical trials and evaluations for the efficacy and safety of its target population. But that’s not the case: Nuplazid essentially tiptoed into the market through the FDA’s equivalent of the cellar door, a legal but unusual method of entry. In other words, the mounting fatalities reported by CNN — and the spiraling costs for the drug that Medicare and private insurance payers are reimbursing — would never have occurred if Nuplazid’s manufacturer had followed the FDA’s standard drug-approval practices. To understand what’s happened consider how Acadia and Nuplazid fit into the spectrum of the pharmaceutical industry’s efforts to combat neurodegenerative illnesses like Parkinson’s disease. According to the basics of brain chemistry, the substantia nigra pars compacta is a part of the brain stem whose key function is producing dopamine. That chemical transmits and processes signals between the brain cells that govern the human motor function, memory and the response to pleasure. Parkinson’s disease greatly diminishes the production of dopamine, and the neural pathways that carry dopamine deteriorate to a point where motion is mostly inhibited, leading to the muscular shaking and trembling that are the illness’ hallmark. There is no cure for Parkinson’s disease, and despite prodigious amounts of medical research few therapeutic prospects are on the immediate horizon, even as a gallery of once devastating afflictions — from polio to HIV — have become preventable and treatable. This is not for want of trying: A long list of pharmaceutical companies have spent billions of dollars on research and development of various remedies for Parkinson’s disease only to be forced to abandon their efforts as clinical testing has revealed a lack of efficacy or safety (or frequently both.) A 2014 article in Alzheimer Research & Therapy pegged the failure rate at 99.6 percent (or 243 of 244) for all the trials from 2002 to 2012 for drugs to treat neurodegenerative diseases. Since the mid-1960s treating Parkinson’s disease has typically involved prescribing levodopa, an amino acid that when taken with carbidopa can stimulate the brain’s dopamine production and restore much of a patient’s normal muscular function. But these improvements are often temporary since the disease’s progression degrades the cells storing the newly made dopamine. And taking levodopa carries complications, since an elevated level of it has been linked to episodic hallucinations, anxiety and muscle tremors — the very symptoms patients need addressed. Standard antipsychotic drugs offer little respite since they block the very dopamine receptors that are already in bad shape. And what’s more, the FDA has issued a so-called black box warning on this class of drugs due to the elevated risk of a stroke for elderly people with dementia. Enter Acadia’s Nuplazid. Developed in the late 1990s, the drug was designed to stimulate a subset of the brain’s serotonin receptors, or the proteins that govern memory, cognition and learning. Relying on initial laboratory results, Acadia’s management argued that the drug should be able to lessen or eliminate the episodic hallucinations. There was just one hitch: Nuplazid, when tested on people, has been a bust from the very start. The drugmaker has had a brutal time demonstrating that the medication works better than a sugar pill. For example, Nuplazid’s first clinical trial closed in March 2007, without any posting of results. The drug’s third trial ended in March 2014 but did not indicate any meaningful statistical difference between the medication and a placebo. Statistically speaking, a drug trial whose range of results include zero is judged to be a failure in that the drug’s therapeutic benefits are deemed to be too small to be of medical consequence. Faced with a third failure, Acadia’s management might have decided it had reached the end of the road in trying to successfully develop the drug. But due to a provision of the Food and Drug Administration Safety and Innovation Act, however, in August 2014 Acadia was able to get Nuplazid classified as a breakthrough therapy, a status conferred on therapies with “substantial treatment effects” in their initial clinical tests. More baffling still was the FDA’s willingness to assess whether Nuplazid worked based on “a negotiated evidentiary standard” that eliminated long-standing evaluation criteria. In a November analysis, Quarter Watch, a publication of the Institute for Safe Medication Practices, flagged several ways the approval process of Nuplazid was unusual. For example, the FDA permitted the drug’s efficacy to be measured against an index of nine psychotic symptoms — as opposed to the standard 20-point scale — and the patients in the study were exclusively advanced cases (the most likely to be responsive to any drug). The agency also allowed Acadia to stage only a single trial (rather than the usual two) and to run it just in North America, where its previous results had been marginally stronger. The physician responsible for leading the FDA’s medical review of Nuplazid, Dr. Paul Andreason, recommended against the medication’s approval, asserting there was an “unacceptably increased, drug-related, safety risk of mortality and serious morbidity.” Andreason worked for 26 years for the U.S. Public Health Service until leaving it in 2016; he spent 13 years with the FDA. His no vote was unusual in that it publicly revealed fault lines inside the division over what constitutes an appropriate level of patient risk. 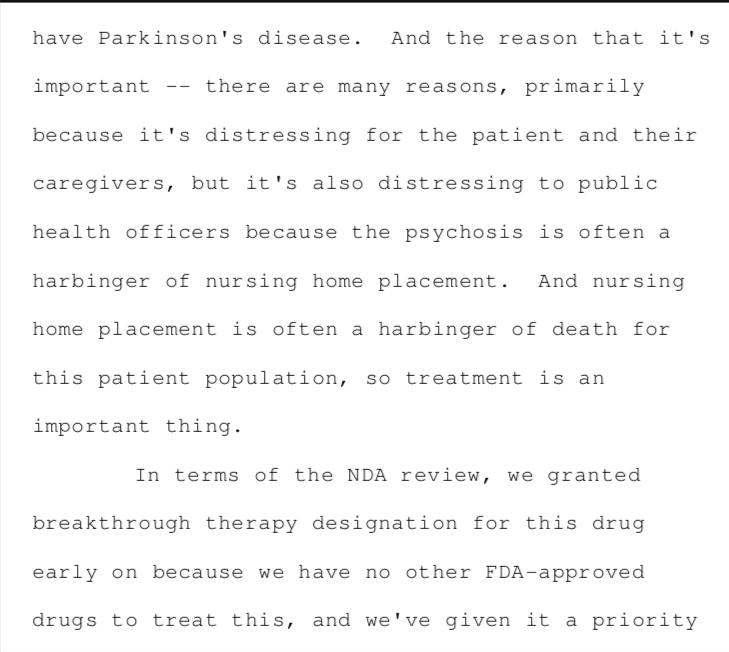 Presumably, Nuplazid would not have been given a breakthrough therapy designation if the FDA’s psychiatry product unit’s leadership thought the drug was unlikely to win approval. As ProPublica recently described, over the last several years the FDA’s approach to the review process for Nuplazid and a series of other drugs has shifted to active cooperation with pharmaceutical companies in getting their drugs commercially launched — and away from serving as a strict arbiter of science and as a guardian of consumer safety. 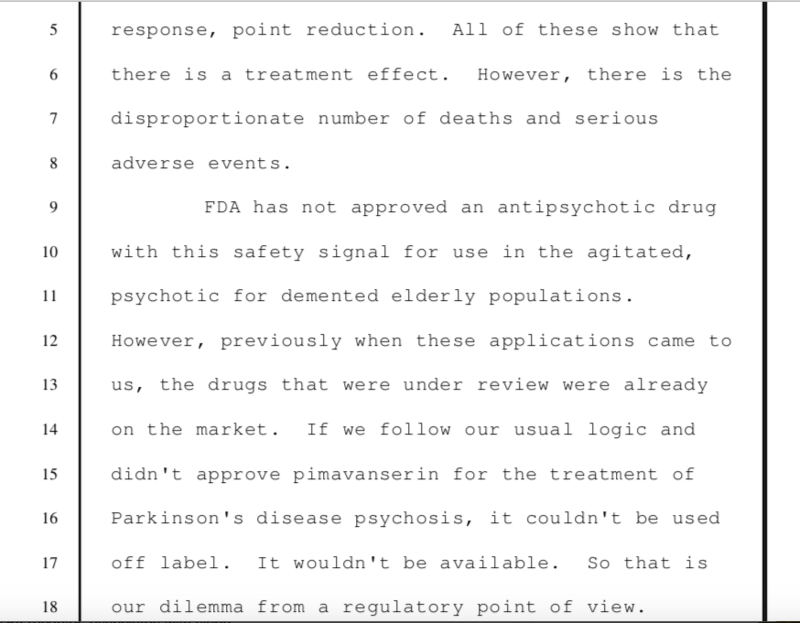 Andreason’s presentation to the FDA committee, summarizing the research he conducted and outlined in the meeting’s transcript, described Nuplazid’s results as presenting a “safety signal.” Specifically, 49 of the 459 patients who took the drug on a long-term basis either died during the trial or within 30 days of its completion. This represents a fatality rate that’s higher than 10.6 percent. For the placebo group, according to the FDA’s briefing document, the figure was 1 out of 210 in a key trial. For the 901 patients who took at least one dose of Nuplazid, the associated fatality rate was slightly higher than 5.4 percent. Andreason also observed that the patients taking Nuplazid had about a two-and-a-half-fold increase in the observed risk ratio — defined as reported incidents of an infection, a patient’s deterioration in mental clarity or death — when compared with the rate for those taking the placebo. After weighing this evidence, the panel determined there was a lack of a “pathologically unique” identifier connecting Nuplazid to the 49 deaths. And given the fact that on average people with Parkinson’s disease may live only two to four years after the onset of psychosis, the panel did not classify the number of deaths among trial participants as unusual. Dr. Andreason did acknowledge data that pointed to some patient benefit from Nuplazid. (There were 14 reported cases of people who took Nuplazid and showed remission from Parkinson’s disease psychosis versus a single reported remission among the placebo group.) But he told the panel that the FDA’s “usual logic” would require rejecting the drug. And Dr. Andreason had company within the FDA in expressing concern over Nuplazid’s safety. 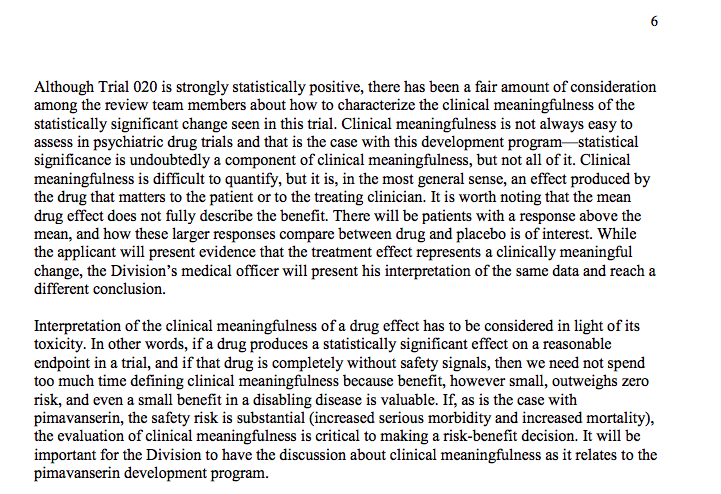 As part of the briefing document prepared for the review panel, division of psychiatric products chief Dr. Mathis wrote a memorandum noting that while the drug’s trial was considered “strongly statistically positive,” he and some of his colleagues were hesitant to accept that the reported results were indeed “clinically meaningful,” especially in light of the drug’s “toxicity” and substantial safety risk. He said that his recommendation to reject Nuplazid represented a statement. But his views didn’t sway a majority of the panel’s members; Nuplazid gained approval for commercial use on a 12 to 2 vote. So why did Dr. Andreason’s colleagues overlook his arguments? “The philosophy of our health care system has changed: People and doctors are taking a different stance than 20 years ago,” Andreason said, describing the emergence of a worldview stressing the importance of family and caregiver perceptions of the quality of life for a Parkinson’s disease patient. This shift, he said, demands that doctors do everything possible to help family members with their efforts to make their loved ones comfortable. In a Lancet Neurology study published in February, Dr. Clive Ballard, a faculty member and dementia specialist at Great Britain’s University of Exeter Medical School, said over a six-week period Nuplazid demonstrated “efficacy in patients with Alzheimer’s disease psychosis.“ But he neglected to point out that nearly all substantive tests on antipsychotics last 12 weeks. In a commentary on the Ballard-led study that was commissioned by Lancet Neurology and published alongside it, Dr. Lon Schneider, bluntly dismissed Nuplazid’s prospects for treating Alzheimer’s psychosis. “The results of this trial cannot be considered to be positive or clinically meaningful,” Schneider wrote about the 2017 study conducted at 133 nursing homes in England. Yet, there’s an odd feature to the study: According to the study’s chart tracking patient responses, at the six-week point the reported results from the placebo and Nuplazid deviate. 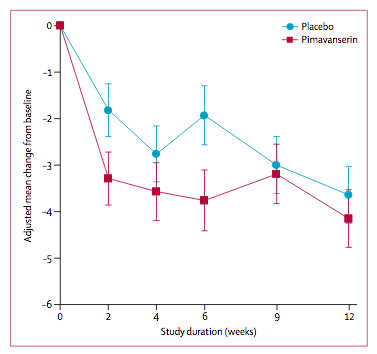 But before and after the six-week mark, the results from Nuplazid and those of placebo essentially mimicked each other, suggesting that the drug had a minimal effect on most Alzheimer’s psychosis symptoms. No explanation for this hiccup is apparent other than it being so-called noise, an artifact, or an error introduced at some point in the testing process. The study measured results using the neuropsychiatric inventory for nursing homes, or NPI-NH scale, assigning points based on how well Nuplazid addressed standard Alzheimer’s psychosis symptoms. So the lower the score, the more favorable the reaction. For instance, if a patient’s difficulty in sleeping increased (or was unchanged) after starting to take Nuplazid, this case was assigned one point. If the sleeping difficulties improved, the score was zero. 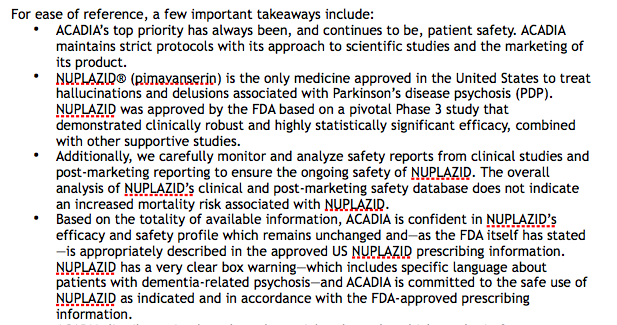 The upshot of the FDA panel’s approval of Nuplazid for Parkinson’s disease psychosis is that the drug is selling like hotcakes despite, as noted above, the unfavorable media scrutiny and the remarks from FDA Commissioner Gottlieb. Bet on that changing, though. Much of Acadia’s business model appears to have been built using as a template the methods of Avanir Pharmaceuticals, an Aliso Viejo, California-based, neurology-focused company with a pair of drugs currently on the market. (Avanir is owned by Japan’s Otsuka Pharmaceuticals.) 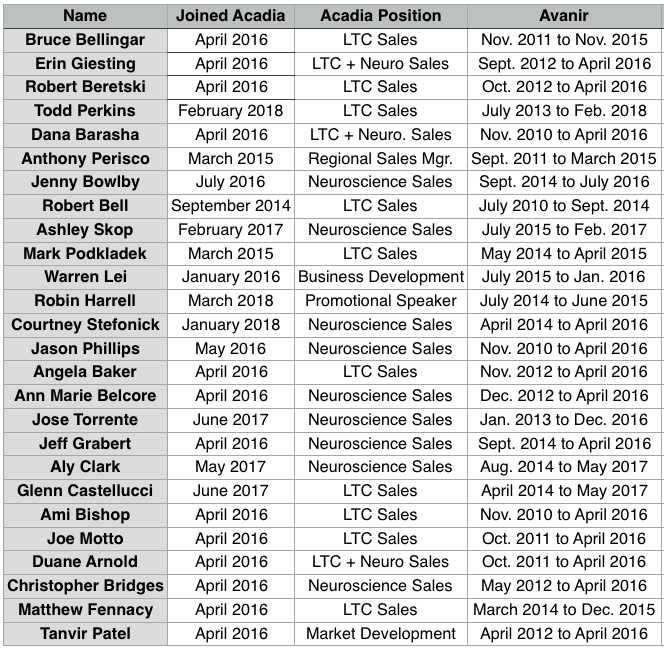 Since April 2016 Acadia has hired 26 former Avanir staffers, with 22 of them serving as sales representatives: Ten of the 22 sell the drug primarily to nursing homes and other long-term care facilities. If the name Avanir rings a bell, it may be because CNN’s October investigation found the company’s marketing strategy was medically and ethically dubious. The company’s drug, Nuedexta, treats a condition called pseudobulbar affect, a rare side effect of multiple sclerosis and Lou Gehrig’s disease resulting in sudden, uncontrollable bouts of laughter or crying. Instead of peddling Nuedexta to the rare neurologist whose patient was experiencing pseudobulbar affect, Avanir’s sales staff found many physicians willing to prescribe it off-label to elderly people with dementia or Alzheimer’s disease. 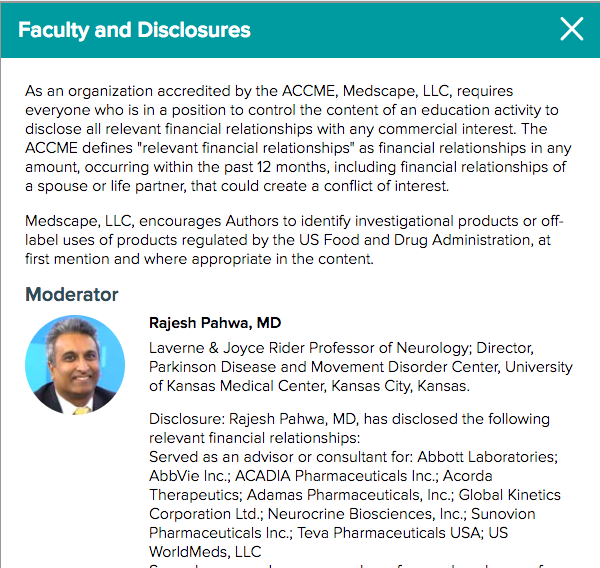 The investigation uncovered a close connection between the upward trajectory of Nuedexta’s prescription volume and Avanir’s payments to physicians for consulting and speaking fees. 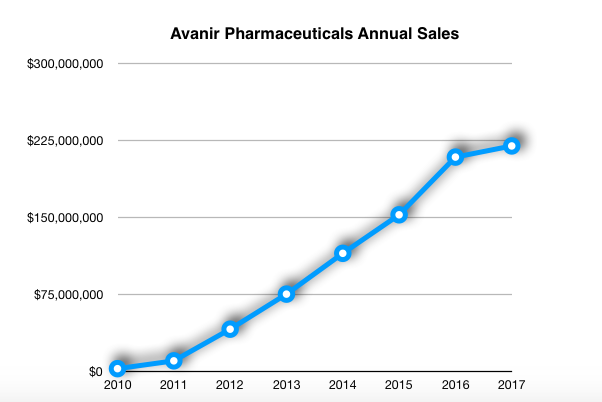 Avanir’s off-label sales strategy initially increased the company’s revenue and propelled its stock price growth, from the drug’s November 2010 launch through the end of 2016. But adverse publicity after CNN’s October story weighed heavily on Nuedexta sales last year, with its $219.4 million total being about $55 million below management’s projections. Dig into Avanir’s quarterly filings, however, and Nuedexta’s waning prospects appear in sharper relief. In the second quarter of 2017, sales of the drug totaled nearly $64.5 million. But in the first quarter of this year, its sales declined to $49.8 million. A Centers for Medicare and Medicaid Services warning last month to insurers “about increases in [Nuedexta] utilization that may not be readily discerned or may relate to potential fraud” is sure to accelerate this downward arc. Yet Otsuka’s management’s Nuedexta sales estimate for this year (made in February in the supplement to its annual financial filings) is more than $300 million, which would represent an increase of about 25 percent over 2017’s results. Unlike Avanir, Acadia doesn’t have a deep-pocketed parent to absorb the potentially steep costs should regulators and plaintiff’s lawyers begin to demand answers. 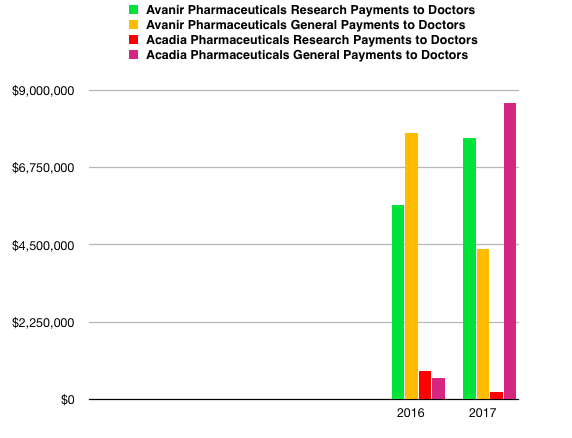 One area where Acadia has hewed closely to Avanir’s script can be found in the Centers for Medicare and Medicaid Services Open Payments data. In a word, Acadia didn’t just open up its corporate wallet for doctors: It pointed a hose and sprayed cash at them. Over the six months that Nuplazid was commercially available in 2016, Acadia spent $609,556 on consulting, speaking and travel and lodging payments to 1,578 doctors: Pomona, New York, psychiatrist Dr. Leslie Citrome’s $25,690 payout amounted to the largest sum, followed by the $19,142 paid to Dr. Khashayar Dashtipour, a Loma Linda, California-based neurologist. For 2017, Acadia paid more than $8.6 million to 7,051 physicians, with 62 doctors receiving more than $50,000 apiece, and 26 receiving at least $100,000 each. Given the fact that Acadia hired a significant number of former Avanir sales staffers, a substantial number of doctors have ended up receiving consulting payments from both Avanir and Acadia in the same calendar year: A total of 31 did in 2017, as did 29 in 2016. Out of that group, a dozen doctors took in $5,000 apiece or more from the two companies in 2017. Just six did in 2016. Since Acadia doesn’t release Nuplazid’s prescription count, Medicare Part D data is the only way to observe prescriber behavior. To that end, overlaying Medicare Part D prescription volume from 2016 (the latest period for which data is available) against the Centers for Medicare and Medicaid Services Open Payments data for 2016 and 2017 illuminates a few things. 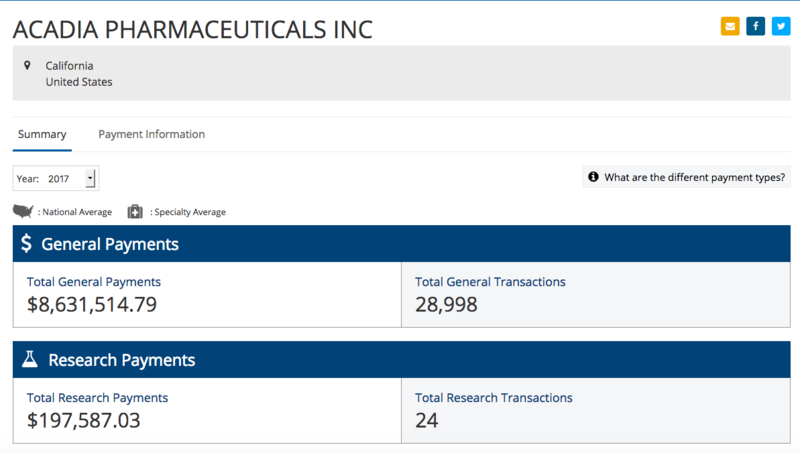 There’s a good deal of overlap between those who received Acadia consulting fee payments in 2016 and 2017 and the individuals who prescribed Nuplazid with some frequency in 2016. For instance, in 2016, 14 of the 25 most frequent prescribers of Nuplazid to patients covered by Medicaid Part D received “consulting fees” in 2017 worth more than $1.21 million in total. Almost 37 percent of Acadia’s $1.21 million in consulting fee payments, or $443,014, went to three neurologists who conducted Acadia-funded studies on Nuplazid and published journal articles about their findings: Dr. Neal Hermanowicz; Dr. Stuart Hal Isaacson of Boca Raton, Florida; and Dr. Rajesh Pahwa of Kansas City, Kansas. 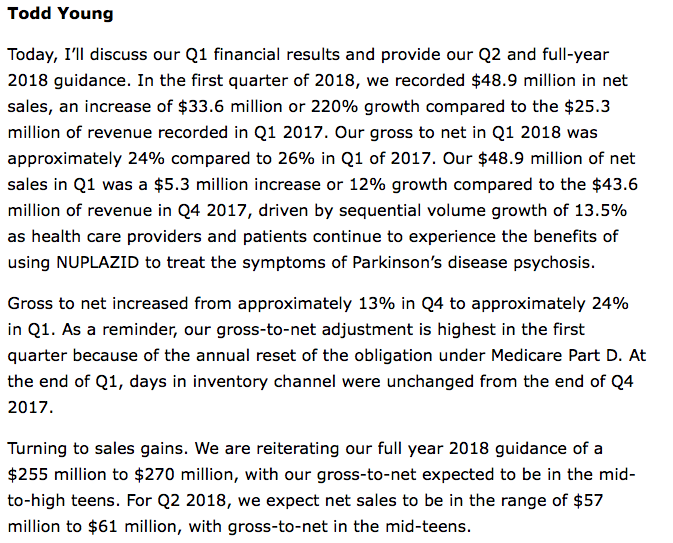 In addition, despite its skyrocketing sales, Nuplazid appears to have had some challenges in gaining traction among the neurologists and psychiatrists who treat Parkinson’s disease and other movement disorders. According to a review of data for all Nuplazid prescriptions paid for by Medicare Part D, 2,020 doctors or other medical personnel wrote at least one prescription for the drug in 2016. (The Centers for Medicare and Medicaid Services doesn’t list the names of individuals who write fewer than 11 prescriptions, due to patient-privacy concerns.) Only 170 doctors or other eligible prescribers wrote at least 11 prescriptions. Acadia told the Southern Investigative Reporting Foundation that less than 5 percent of Nuplazid’s prescriptions come from its top 10 prescribers. The money behind Nuplazid is only its second most compelling characteristic. The first is the sheer number of medical issues that appear to be linked with the drug’s use. 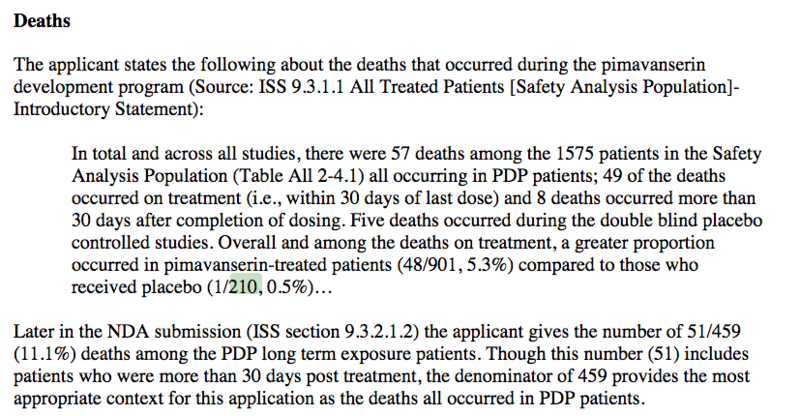 These adverse event reports aren’t considered as conclusive as an official autopsy, and the fact that a patient died while taking a certain drug doesn’t mean the medication caused it. Also, this completely voluntary reporting system allows for a wide array of filers. Family members, caregivers and trained medical professionals can make submissions. So the level of accuracy and detail can vary widely. Finally, many medical professionals have suggested that because this documentation is voluntary, many incidents involving drugs are not reported to FAERS. An analysis of the longer-form FAERS case reports — obtained via Freedom of Information Act requests — illuminates Acadia’s success at getting prescribers to order Nuplazid for patients within long-term care facilities. The majority of the adverse events for these patients involved off-label use of the drug for various dementia-related psychoses, despite the explicit black-box warning. A notable feature of many of the individual case reports that documented a death is the brevity of the patient’s experience with Nuplazid. Given the spotty information found in many reports, though, it’s difficult to arrive at precise numbers overall. But for those case reports citing a death that also provided a time frame for the patient’s treatment with Nuplazid, exposure to the drug had been less than 90 days on average. For example, a 75-year-old man, identified only as Case ID: 12689689, began taking Nuplazid on Aug. 3 2016. By Aug. 26 he was dead. His cause of death was listed as “unknown,” but the case report said he had been diagnosed with Parkinson’s disease dementia. 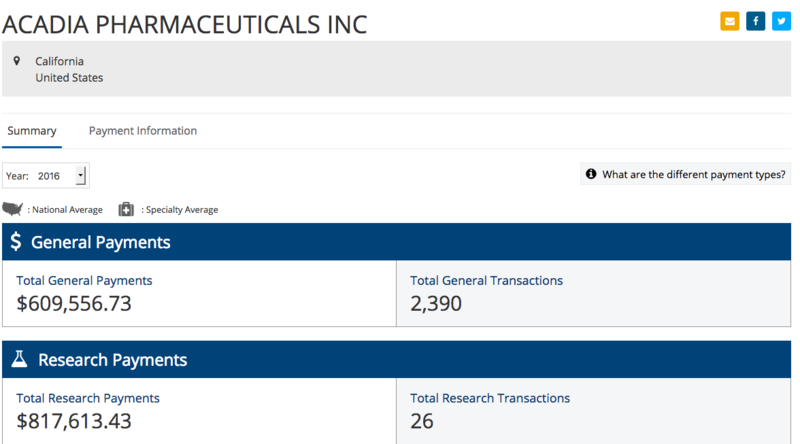 To gain a sense of how Nuplazid’s number of adverse event reports compares with other Parkinson’s disease-focused drugs, the Southern Investigative Reporting Foundation used the FAERS database to create two charts. If Nuplazid’s death rate was parallel to other Parkinson’s drugs, the explanation for it would be unlikely to be drug-related; alternately, if those taking Nuplazid died more frequently than the comparison group, re-visiting the drug’s safety profile would be logical. 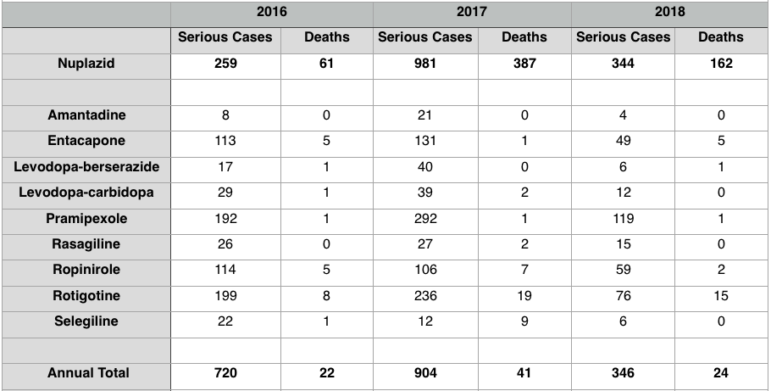 The first compares the number of serious incidents and deaths reported for people taking Nuplazid with the tally of serious incidents and deaths for individuals taking nine other Parkinson’s disease medications; the time frame considered was from June 2016 through the end of this past March. The nine other medications have longer track records for the treatment of Parkinson’s disease. 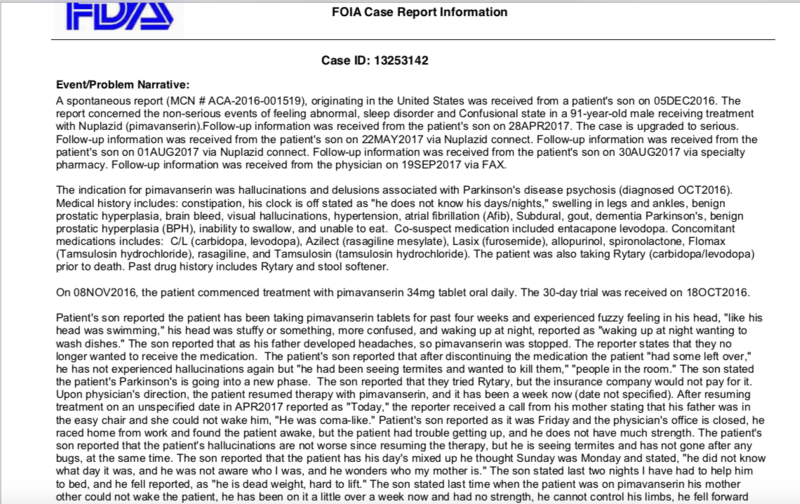 Reports uploaded to the FAERS database that indicate a patient died while taking Nuplazid sharply outnumbered the reported deaths of those on the nine other drugs: A total of 610 individuals died while taking Nuplazid but just 87 died while taking any of the nine other medications. Nuplazid-tied deaths represented more than 38 percent of the total number of serious incidents; but for those taking any of the other nine medications, death amounted to less than 5 percent all serious incidents. 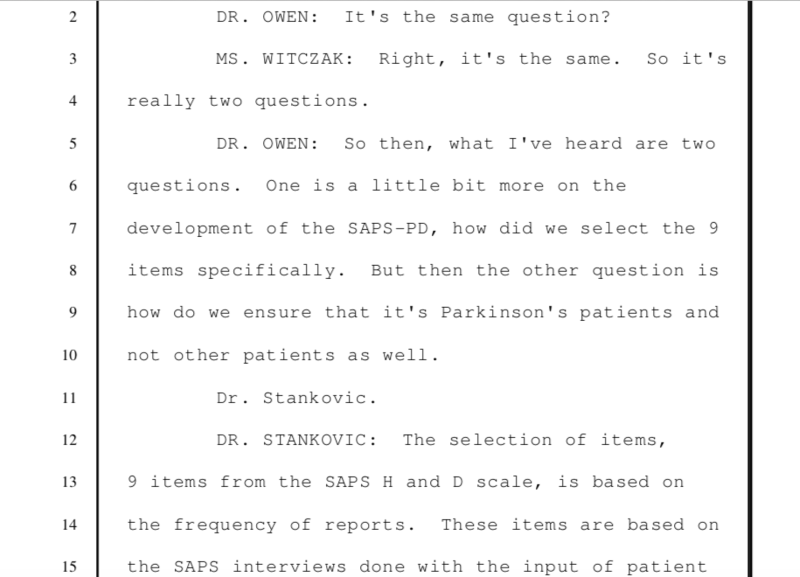 These results cannot be interpreted as definitive: Patients taking Nuplazid are usually quite frail since they have had Parkinson’s disease for several years and might be weaker on average than the people on the nine other drugs. Additionally, newer drugs tend to draw more FAERS submissions than more established ones. But these results certainly show Nuplazid has a radically different safety profile than other Parkinson’s disease treatments. A second chart explores whether Nuplazid’s seemingly high level of adverse event reports is similar to reactions to another central nervous system-targeted drug, Namzaric, which was approved in 2014 for treating Alzheimer’s dementia. A few variables are skewed in Namzaric’s favor. There is a high probability that the Alzheimer’s dementia patients who take Namzaric are frailer than the people being given Nuplazid. Also, Namzaric’s parent company, Allergan, has spent more than four years and tens of millions of dollars on advertising online and on television to raise the drug’s profile. It stands to reason that a new, high-visibility drug like Namzaric would, if warranted, receive a great deal of adverse event submissions. 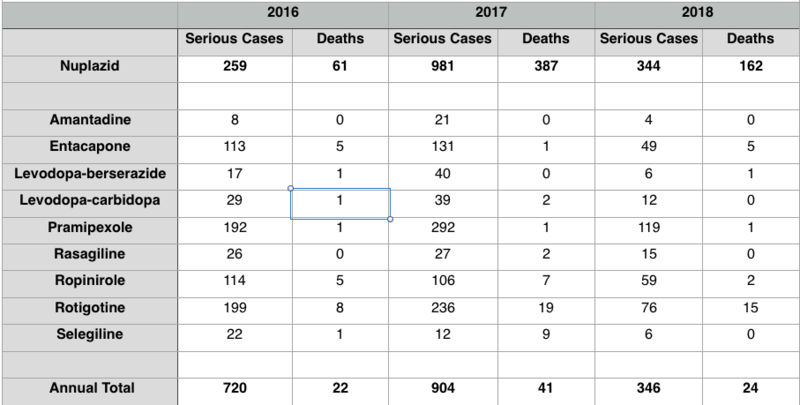 As the chart below shows though, it hasn’t: The number of reports of fatalities and adverse events associated with Nuplazid is much greater than that for Namzaric. Calculating the number of deaths as a percentage of the number of adverse events associated with the rate for Namzaric is tricky because few people who took either drug did so for the same amount of time. Fortunately medical statisticians can rely on a measurement tool called “patient years.” It is an average of how many patients have taken a specific drug over the course of a given year. For example, assume a certain drug costs each patient $10,000 a year to take and that the medication had $100,000,000 in sales. Using the patient years calculation, researchers could say that roughly 10,000 patients took the drug for one year. For this chart each drug’s annual sales figure was divided by its retail price at the end of 2016 and 2017: Namzaric cost $4,249 at the end of 2016 — and $5,069 in 2017. For Nuplazid, it was $25,000 and $33,336, respectively. Namzaric’s patient years figures in 2016 and 2017 were 13,536 and 25,805; Nuplazid’s were 692 and 3,747. “Deaths per patient year” is a rough statistical way of measuring patient deaths while assuming the typical patient used the drug for a full year. Epidemiologists call this “the excess death rate,” or the number of deaths above what is reasonably anticipated in a population group. The number of patient deaths for Namzaric was a scant .0001; Nuplazid’s tally, however, was .0881 in 2016 and .1033 in 2017. So in 2016, if 1,000 patients took Nuplazid for one year, about 88, or 8.8 percent, could be expected to die over and above the already steep mortality rate of approximately 25 percent; in 2017 the figure would rise to 103. But it would take 10,000 patients on a Namzaric protocol for a full year for a single death to result. 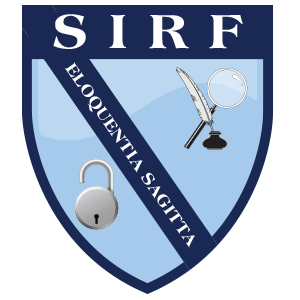 Editor’s note: To obtain the fairest profile of the drug histories, the Southern Investigative reporting Foundation used adverse event reports of “serious cases,” or incidents that required medical attention, and then deaths were subtracted from this total. For the death figures, only deaths reported as a prospective reaction to a drug were counted, as opposed to the higher “death cases” figure that the FDA records. This is the full text of Acadia’s response to the Southern Investigative Reporting Foundation’s questions. Correction: An earlier version of this story inaccurately described Nuedexta’s safety profile — it has never carried a black box warning. Also, Avanir Pharmaceuticals has two drugs that are commercially available. Your article is based on one way facts by quoting the professionals in the industry who disapprove and are biased against the pharma industry. Not one quote or interview with the majority that see positive benefits and outcomes. What about the families, Care Givers and patients that have had their lives turned around because of this medicine? This type of article is full of holes that is so typical and sensationalist to hurt the industry. Talk to families who suffer with PD and PDP everyday and you will get a better story. Thanks for confirming the false news and bias like CNN. The public knows better. Got links to such reports? A bunch of slanted lies. I hope you have good lawyers. I could only read some of the start and slim a bit more because it quickly became extremely obvious that you’re unfamiliar with science and medicine. You present a rather unpopular perspective as fact because the public bought into it. It’s not too far away going anti vaxxer on everyone. Be more careful. 70 year-olds die at over 5% per year, but Namzaric provides immortality? Your numbers are way off therefore the whole comparison is factually incorrect. You have been played by whoever provided you with this data. We know the death rate with Nuplazid is increased based on the RCT on which it was approved. It is all over the FDA docs. What I’m measuring in the Namzaric comparator is whether or not the elevated death rate is simply a function of patients being old/sick. To that end, you would expect a higher death rate in other groups of patients who fall into the old/sick category. In other words, with other PD drugs. We don’t see that. Perhaps it is merely reporting bias — after all, Nuplazid is recently launched. But so is Namzaric, and with a DTC marketing budget that is readily 25x what Acadia can bring to bear. YET: We don’t see an elevated death rate reported on FAERS with Namzaric which strongly suggests it is unlikely to be reporting bias due to a new drug. Maybe this a subtle point but I tried to make it clear in the story’s text. So: If Nuplazid death rate was secondary to PD patients dying at a faster rate then we should see it with all PD drugs, to some degree. And If Nuplazid death rate somehow reflected a reporting bias in FAERS, we should see it with other recently launched drugs approved to treat disease in sick elderly patients — arguably sicker — like Namzaric. FAERS, as I indicated bluntly 2x in the piece, is not perfect by any means and this is why absolute values — their “death cases” are less informative than in comparison with other drugs. Even then, as I noted, I used the longer form case reports to drill down into “reaction” categories to ensure that I would get only reports where Nuplazid was named as a prospective cause of death. Isn’t Namzaric for ALZ? ACAD drug isn’t even approved for ALZ . Shouldn’t you compare it to it’s Parkinson’s comps? Just asking bud? Please advise. I did. Look at the chart above the Namzaric comparison, the one with the nine “standard of care” PD drugs that frankly most every Nuplazid patient has been on prior to, or concurrent with, having it prescribed. Also, the longer form case reports make it abundantly clear that despite the label there is a great deal of overlap between ALZ and PD Nuplazid patients. Moreover, the ALZ patients are actively experiencing dementia episodes, in contravention to the boxed warning. Where is seroquel on your list? Sorry for delay in reply, I’ve been busy. It’s an antipsychotic — granted an atypical one a la Nuplazid — that’s primarily used in conjunction with manic depression. I tried to focus on drugs that are standard of care in PD, and that were either for treating it or like Levodopa, have been in use so long that whatever else they were used for has largely been forgotten. I trust you placed your short sell order just before publishing this deeply flawed, factually incorrect, half-truth tabloid-worthy “article”? Thank you for writing this important and fascinating essay. I was particularly disturbed by ACAD raising prices by 1/3 yoy while increasing payments to doctors. Generally a well researched and informed article. The original research into the FDA documents and approval process was very informative. I would not, however, use CNN as a source. Their articles were clearly biased and completely devoid of objectivity. This article has a clear bias, but at least provides meaningful analysis. The analysis stops when it comes to Avanir, however. 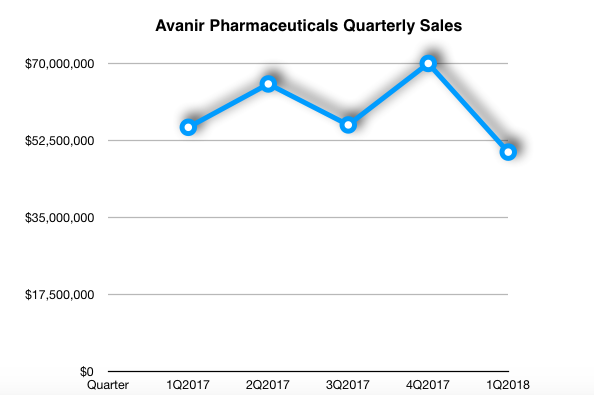 The statement “Avanir’s off-label sales strategy initially increased the company’s revenue and propelled its stock price growth”, but the claim that this growth came from off-label sales is not supported by any evidence whatsoever. Similarly the claim “adverse publicity after CNN’s October story weighed heavily on Nuedexta sales last year” is unsupported, and ignores other significant factors including the reduction of the Avanir sales force by around 40%. Avanir is not Acadia, and Nuedexta (which has an excellent safety profile) is not Nuplazid. The greater story that this, and other stories like this, fail to explore is where the cost benefit in these drugs lies. It is clear that Nuplazid has an unclear cost/benefit ratio if it was free, but it costs $130M per year. This is necessary to cover the costs of the 99.6% of therapeutic techniques that fail, plus the endless series of clinical trials required to prove efficacy/safety of the drug. This article calls for further testing (and further cost). So what do you propose we do, Roddy Boyd? Should we just give up on Parkinson’s Disease Psychosis and let the patients suffer? Or do we continue down this path until we find a marginally better treatment and charge $100,000 per patient to cover another 10 years of failed investigations? Regarding Nuedexta, it is also provided off-label for pseudobulbar affect associated with Parkinson’s. I know because my father was prescribed after he mentioned to his neurologist that he found this symptom hard to handle. He began having serious cardiac issues soon after starting it, and they resolved after a lengthy process of treatment including cessation of the Nuedexta. I’m not suggesting that Nuedexta was the (only) cause, but the timing was curious. There are several cardiac adverse events associated with either drug in Nuedexta and also in the combination, which it should be stated is simply a mixture of 2 generics: Quinidine Sulfate and Dextromethorphan. At the time I looked at the FDA label and it had only been studied in relatively small trial populations in ALS and MS. As the typical patient ages within those diseases are much younger than in AD or PD, I found it troubling that it could have been provided so easily off-label. I can easily foresee an aggressive sales organization behind such a drug that takes shortcuts to patients. There was a good reason that Otsuka bought Avanir, and it wasn’t for R&D pipeline. It seems that whenever an article criticizes Nuplazid, there is an amazingly consistent negative response in the comments. I hope your investigative team will investigate who is making these comments and what their financial ties are to Nuplazid and Acadia. Diane….. do a little digging into the writer of the article. Tied to short sell stock traders. 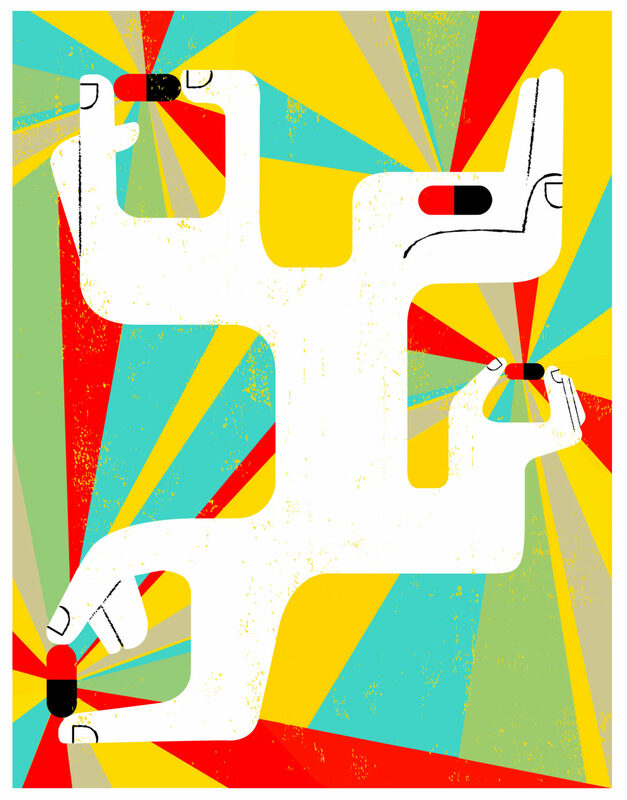 There is gong to be overwhelming negativity when the article is flawed and the drug is not. Nuplazid helps, this buffoon of an writer does not. But, negative symptom schizophrenia, psychosis in dementia, psychosis in PD. If there is any hope in these areas, please, please keep this drug on the market. Who funded this hit piece? You should be ashamed of yourself for disseminating lies and smearing the reputation of a good company. I am glad that the there are organizations like the FDA that indeed engage in science and not this type of journalism. Will you be offering your readers the chance to see what the FDA has released and which has put to rest your claims.